Here at StoneGable, we have a big porch wrapping it’s sturdy arms around our home. Last week I shared my front porch and today I’m sharing a special spot on my back porch for winter sitting. I love to swing or to rock on my back porch even in the winter. 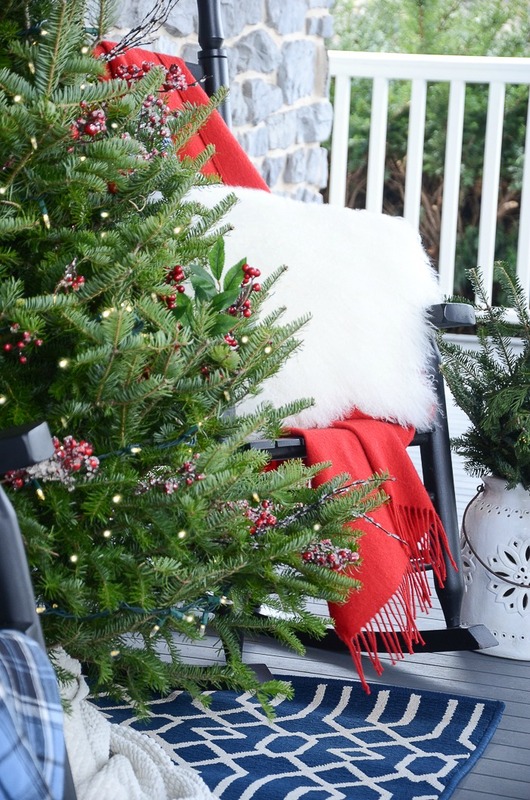 So I decked out back porch rocking chairs with a little Christmas spirit. 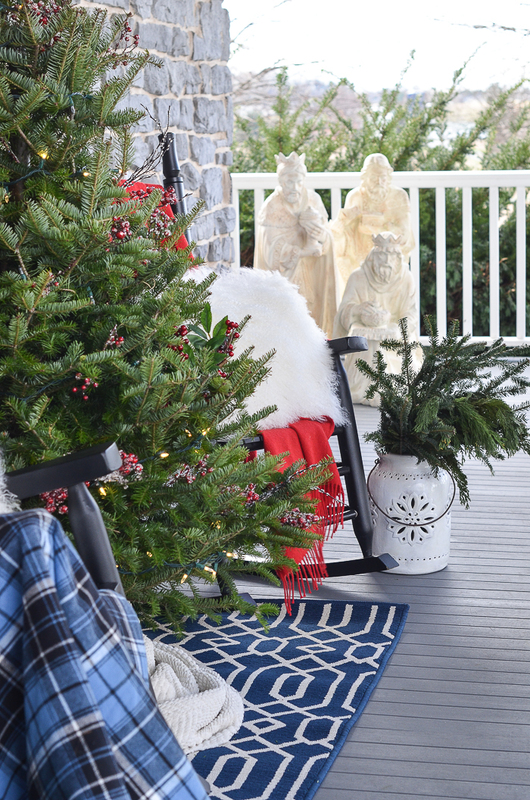 Welcome to Christmas on the back porch. Today I’m participating in THE CHRISTMAS PORCH TOUR. Thank you, Amy, from Atta Girl Says for putting this together every year and including me! Make sure to stop by the end of this post to see some amazing porches, patios, gazebos, and more! I went very natural with my outdoor decor this year! 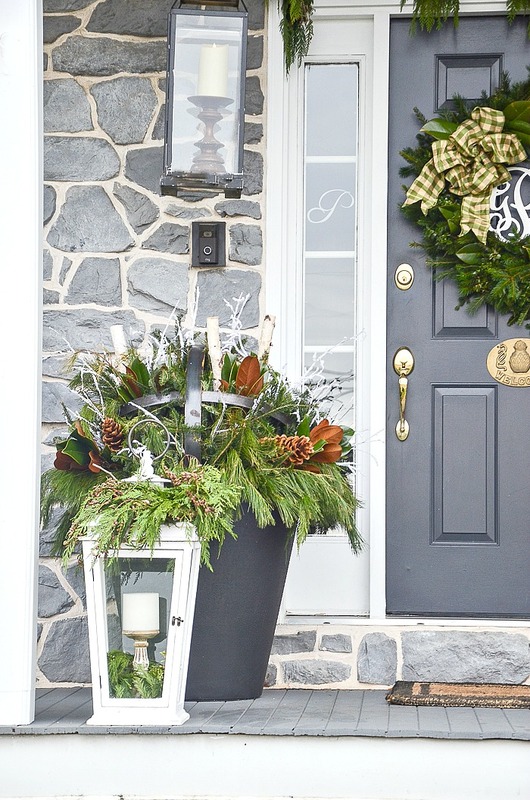 You can see more of my front porch and how to make the big planter filled with greens HERE. 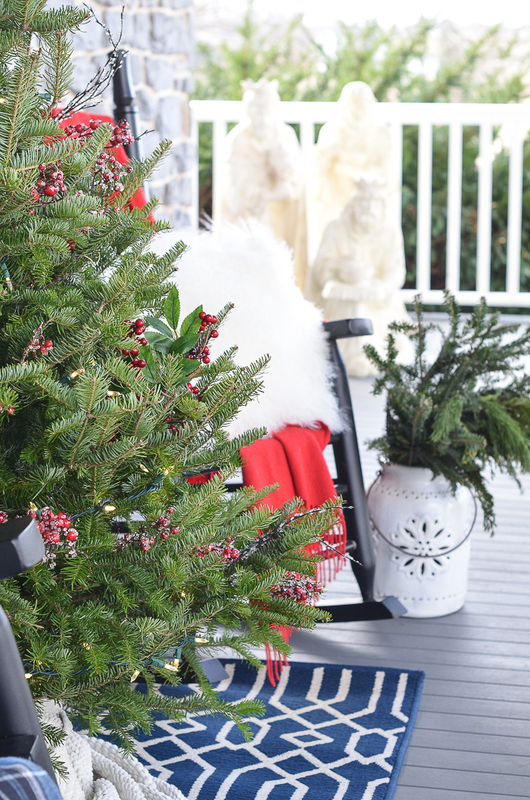 Just like the front porch, the back porch is simple and natural this year. 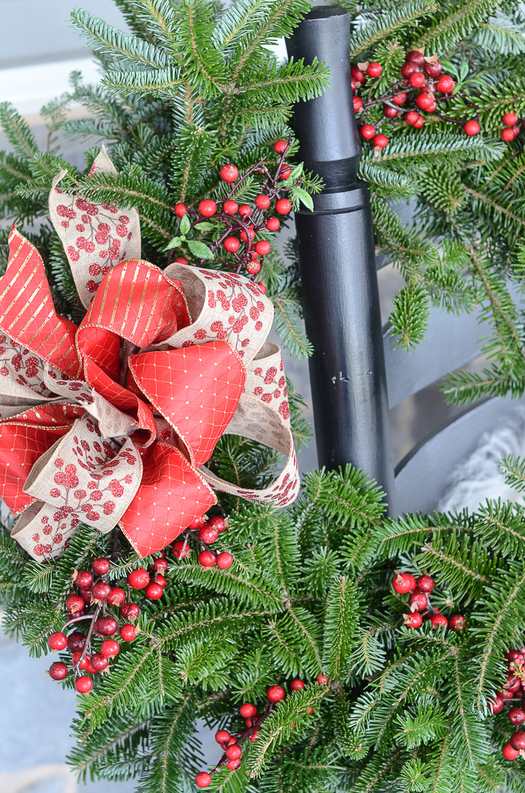 I love live greens outdoors because they will stay fresh through the Christmas season. Because I don’t have a live tree indoors this year I thought the porch was a great place for one. Just a few simple strings of light on the tree is all it needs to look festive! It gets cold here. And I love to bundle up and get under some of the blankets to have my morning coffee and greet the day! It’s so quiet, especially when it snows and that is my very favorite time to enjoy my back porch. 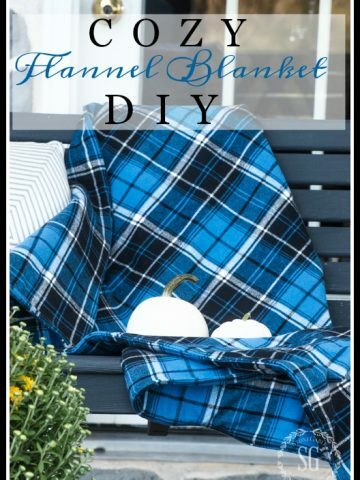 A flannel or fuzzy throw are great barriers to the cold and it feels cozy too! The blue plaid throw is double sided and so warm. I made it and you can see it HERE. My red wool shawl is draped over the back of the rocker. It is super warm and I love wearing it all winter long. 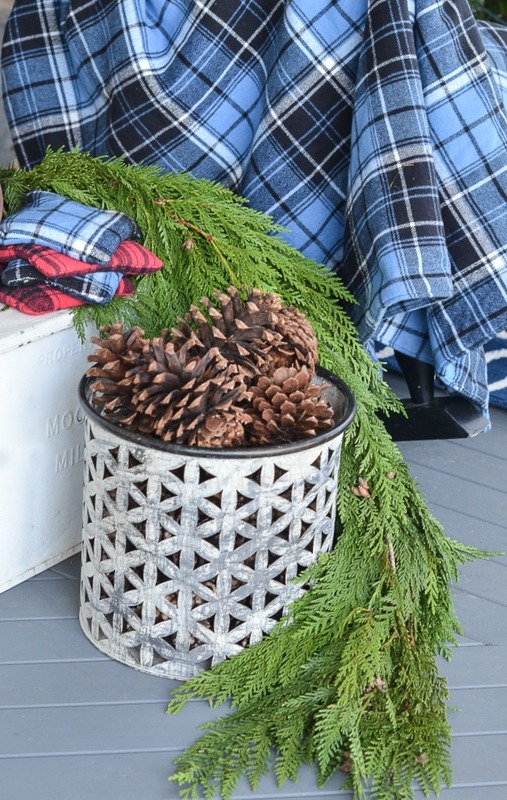 Flannel hand warms get lots of use on the back porch! I made these and you can too. See the tutorial HERE. They would make fabulous stocking stuffers! 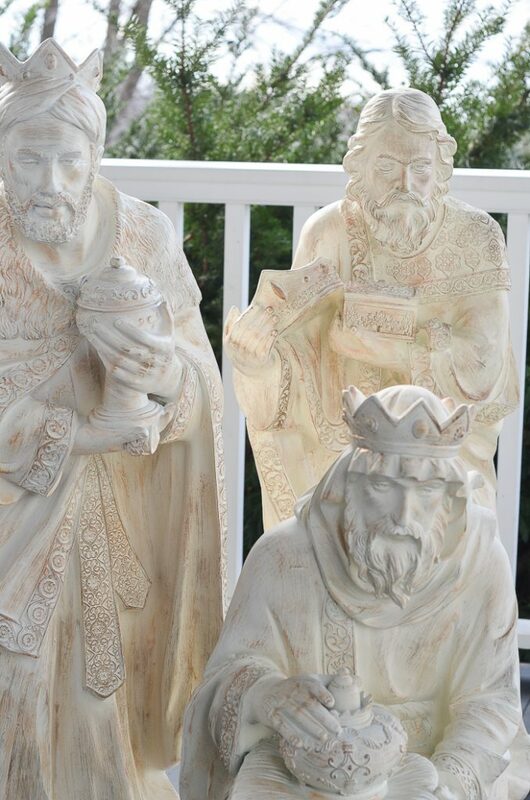 These beautiful Wise Men are journeying around our yard in search of the Christ Child this year. I thought it would be a nice idea to have these wise kings from long ago remind our family and anyone who sees them on their travels that Christmas is really not about the trappings and presents and trees. But it is about a Babe born over two centuries ago who’s purpose was to seek and save the lost. 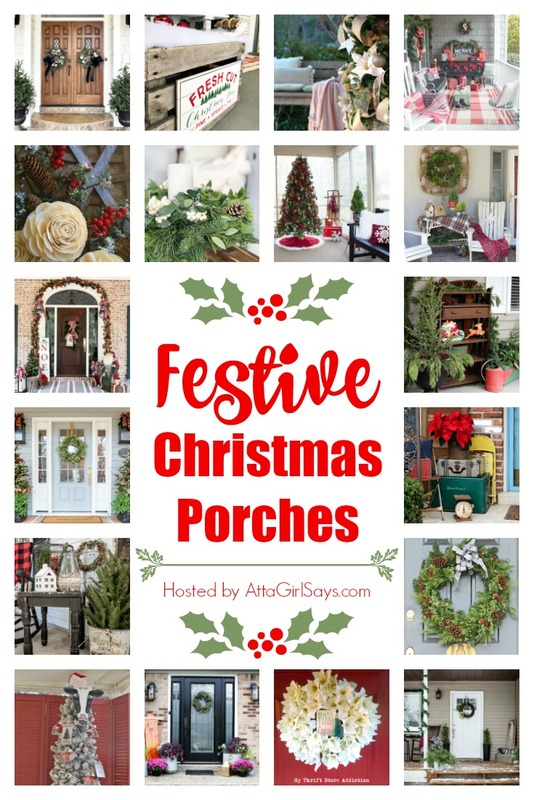 They will be traveling our porch and yard all Christmas season long! to focus on its true meaning just like the wise men who traveled many miles to find the King they were looking for. The Balsam Hill Three Kings are so beautifully made and very detailed. I love the king who has his crown in his hand. He knew who the real king was! His humble expression and adoration touches my heart! Wishing you a Merry and Blessed Christmas from my back porch to yours! 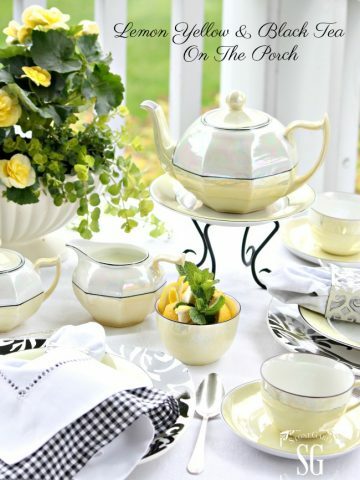 Make sure to visit my blogging friends and their beautiful outdoor spaces! This post is sponsored by Balsam Hill. Thank you so much for the stunning Wise Men. The opinions on this post are totally mine. I LOVE the blue! It’s always nice to see blue mixed in with red Christmas decor, and I think it especially complements the exterior of your home. Pinned! Yvonne, Your porch never disappoints! I love the colors you used this year! Merry Christmas, sweet friend! 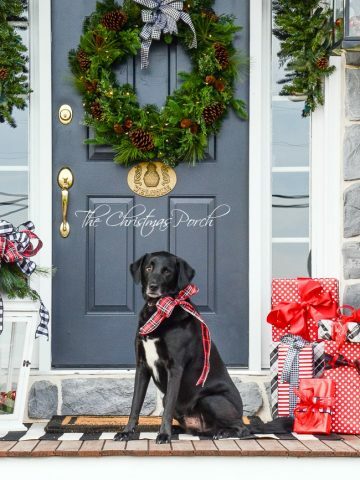 fabulous Christmas porch. I love it all! So pretty! 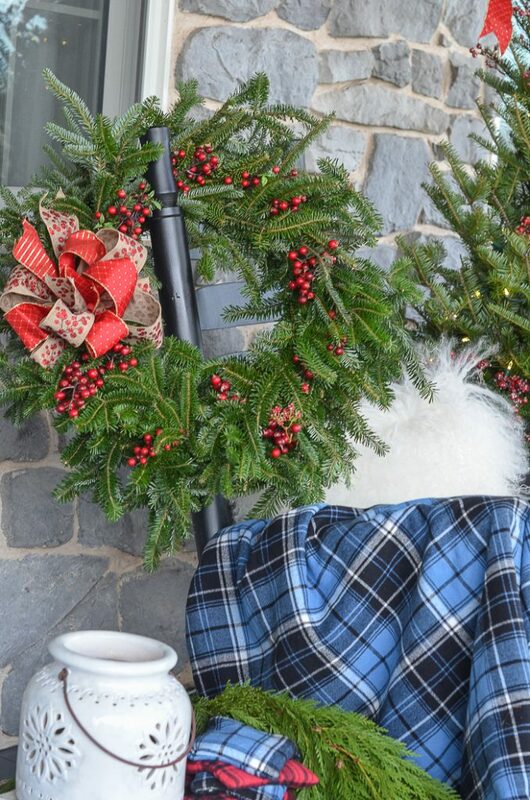 I love the pops of blue plaid with the more traditional colors! Now I totally want to swing by for a visit! Put on the coffee! 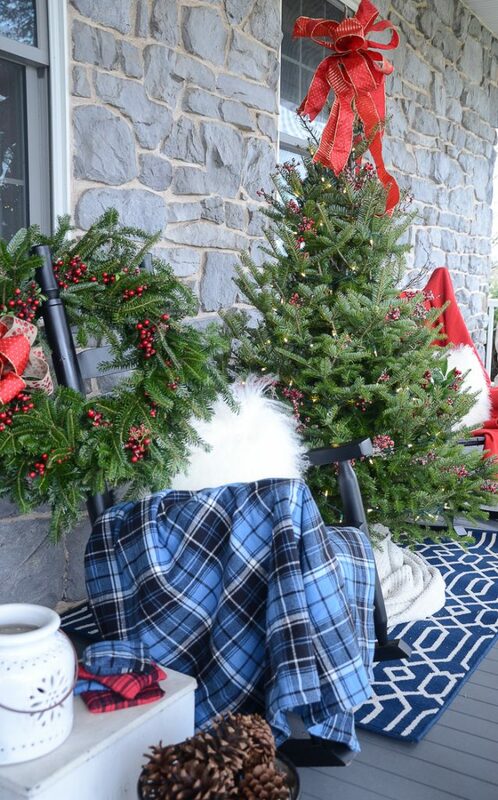 I’m coming to enjoy your lovely porch and that blue plaid throw! What a joyful place you have created to welcome the day. I lived in an old farmhouse with a wrap around porch that was screened on the top half. No snow got in. I don’t remember playing there though during the winter. But if I had this pretty cozy spot I’d be tempted. It’s so inviting. Happy mid week. Your back porch is beautiful. In reality what do you do with the blankets and pillows to keep them dry?! Just dew would cause moisture to accumulate. Your home and decor always stops me in my tracks. 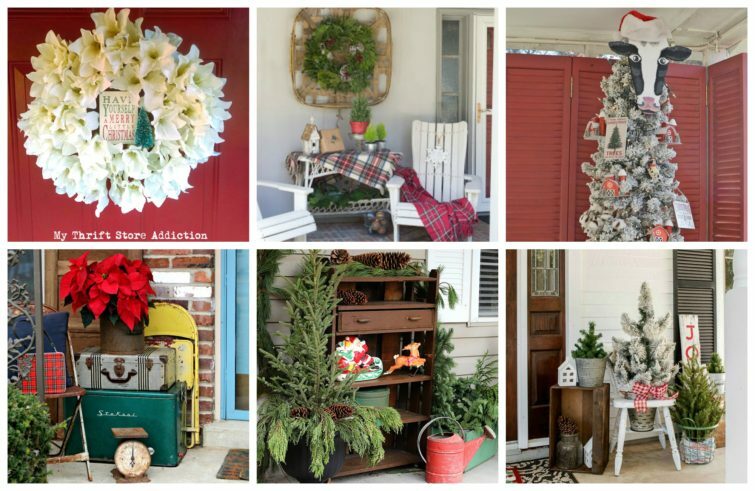 Your porch is beautiful for the holidays! It was fun touring with you this week! Pinning! Lindsay, Thank you so much for pinning. I love my pinning friends! 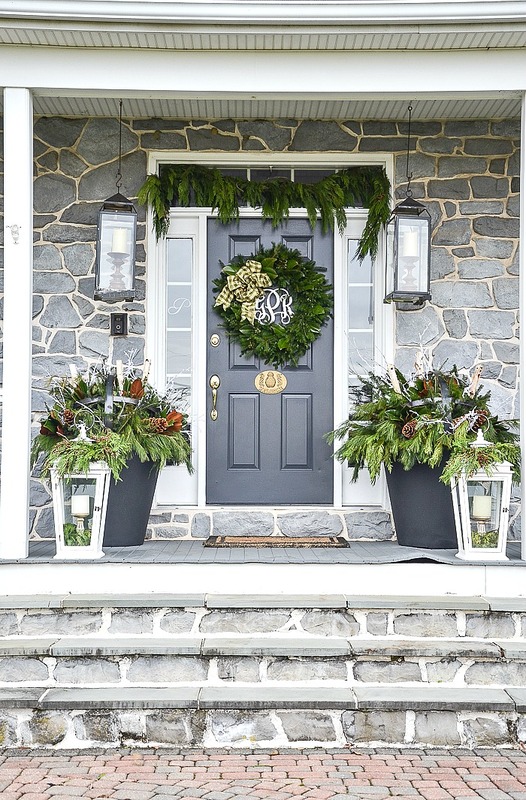 Love all of the florals, your porch is beautiful! 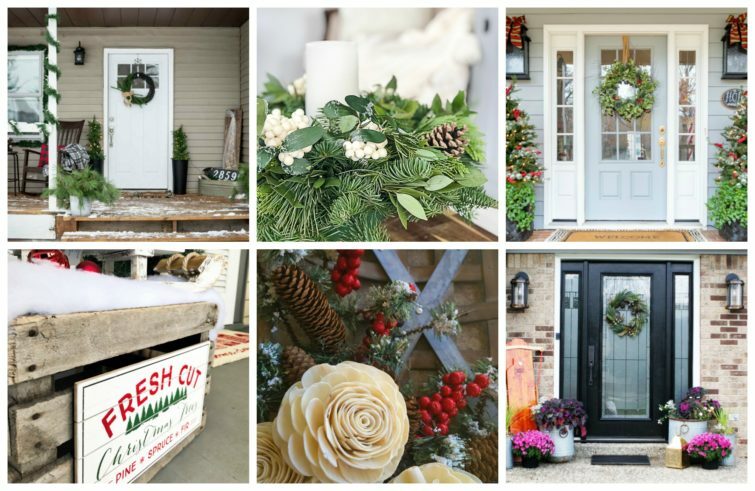 The thing that my eyes went to was the soft green gingham bow on the wreath on the door. While I love red, I’m crazy about that color of green! I love the throw. Gorgeous. Yvonne, your back porch is just lovely. Those wise men are such a beautiful addition. Beautiful, Yvonne, and the wise men are such a wonderful touch… <3 I can only imagine the snow falling… enjoy your coffee and that beautiful back porch! 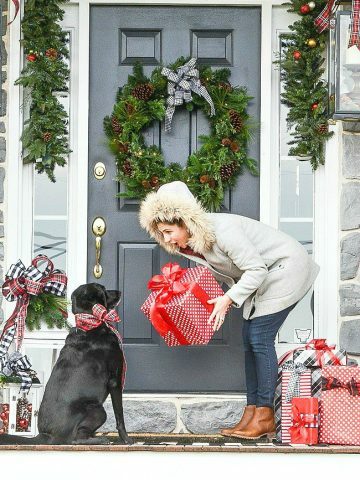 What a beautiful porch decorated for Christmas! I love the live greens, cozy throws and shawl, and especially love the Wise Men looking over all of it. 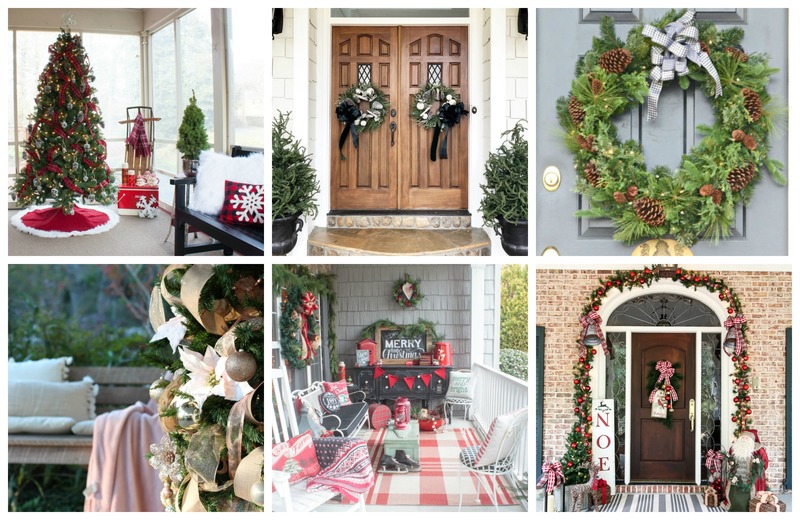 Both your front and back porches are beautiful for the holidays. I am always inspired by your photos and your sentiments. Your ideas are some of my favorites whatever the season. Thank you for the tutorials that show how to create similar looks. Yvonne, this porch is as beautiful as the front one – nothing new considering your exquisite taste – but what grabbed my heart are those wise men and your idea to move them around! In this day and age, this is exactly the decoration we need. Thank you for always guiding us to the Truth. Blessings. 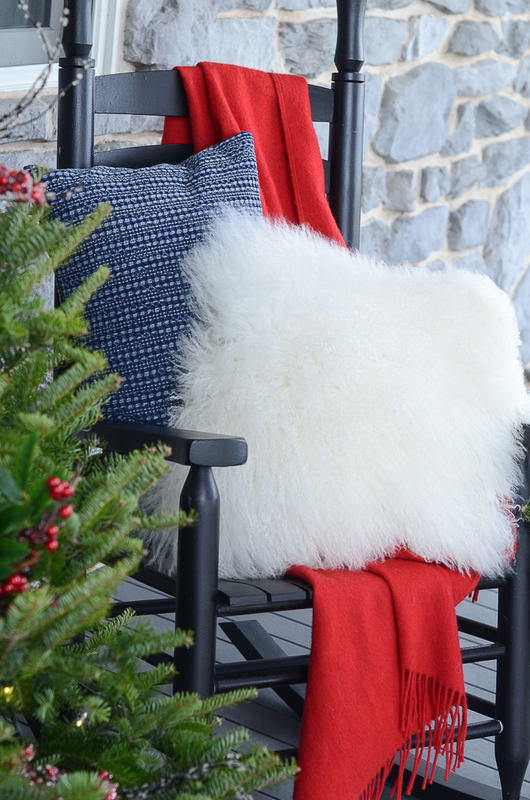 Canadian winters are not really conducive to swinging or sitting on the porch. Out around a huge bonfire, yes. On the porch, not so much. Just lovely! 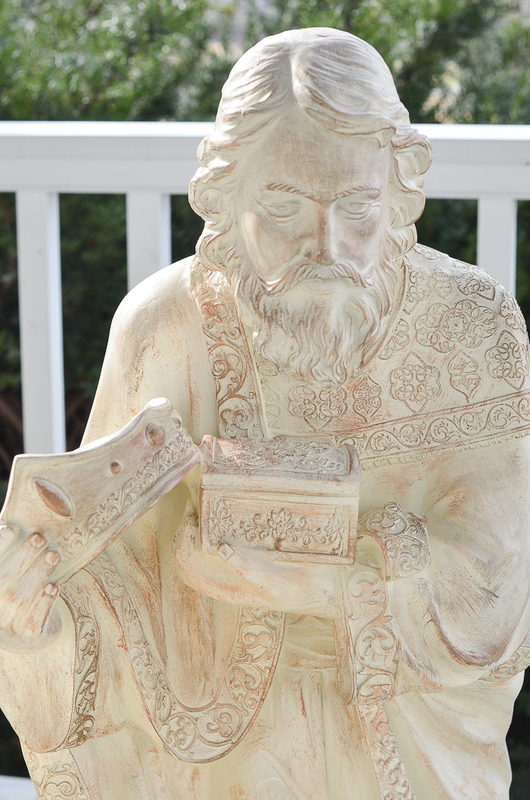 The wise men are PERFECT on the porch! Your natural and simple decor speaks volumes, Yvonne. Just lovely! Yvonne, I love your back porch especially the three kings. 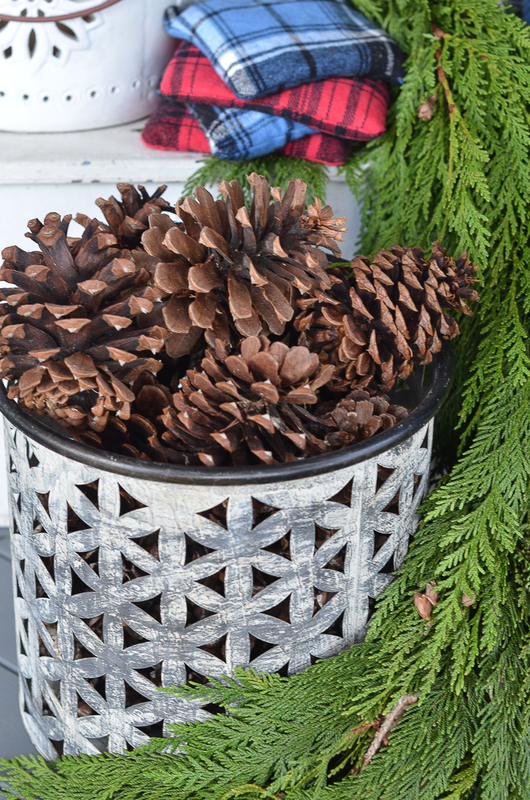 They are a special addition to to your decked out back porch. Have a great day! We had a large front porch when I was young and my next house will have one along with a back porch. Of course my dream is a wrap around but I would be thrilled with just a front and back porch. I will have to visit all of the others and live vicariously through all of you. 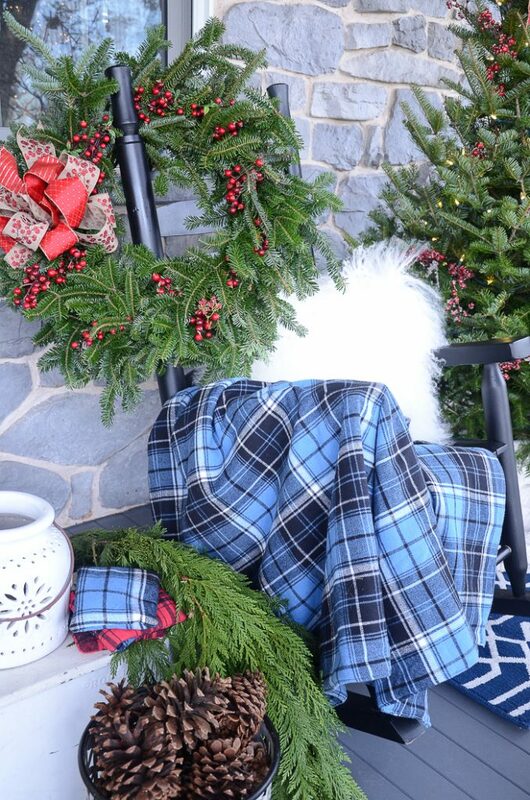 I love the striking blue flannel throw and will have to hop over there. I love the big fluffy white pillow and immediately thought muffler…..I may have to think about how to make one and put some soft cuddly minky fabric inside and a couple hand warmers too. I’m new to your site and love it so far. Thank you for sharing. I love both the front and back porch with all the natural greens,just lovely. Your porch is gorgeous! Love the op of blue in that throw and absolutely adore the 3 Kings!!! Thanks, Pam! We recently painted our porch floor gray so I think the blue worked with it. I love this cozy space at StoneGable. I think I need to come back for a visit and a chat! 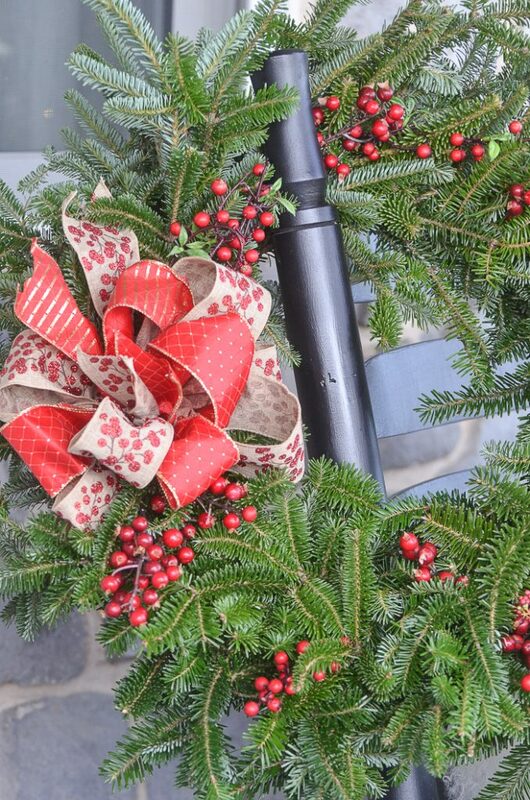 Thanks so much for being a part of the Christmas porch tour again this year. Your decor is always so beautiful and inspiring. Amy, thank you so much for including StoneGable. I’ll be visiting all our blogging friends on this tour from now until Friday. So pretty! Yvonne both your front and back porches look just lovely. I have got my inside decorating done except for the tree but seem to be having decorators block for outside. Hoping my trip to Charelston this week will inspire me. It has been so wet here that gathering greens in the woods has been postponed. Some snow predicted for Sunday so that should put me in the mood. What do you do when a lack of ideas hits you? Enjoy the snow, Kathy! None here yet. I love the details on your Wise Men. Also I am enjoying your site very much. Yvonne, your porch looks so festive and peaceful. The Wise Men are just beautiful. I will look into Balsam Hill for them, I would love to add them to our front yard. Thank you so much for sharing Gods’ Love with us. Merry Christmas. Thanks, Susan! They will make an appearance on our front yard too! The Three Kings are exquisite! And on sale!!!!! Oh Yvonne, how inviting. Red and green, simple yet so festive. I too, like that the one wise man is holding his crown in honor of the only true king. Merry Christmas to you and yours.